On Friday, McKesson sharply lowered its outlook for future profits. Its stock closed down 23%, erasing more than $8 billion of market capitalization. Ouch. 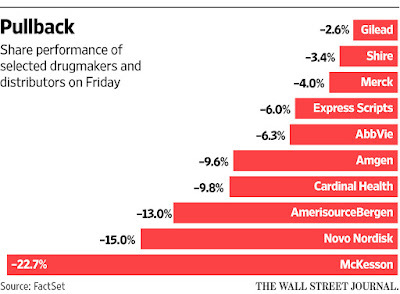 A sell-side price war started by...AmerisourceBergen? McKesson has a plan to recapture its lost profits from customers and manufacturers. Don’t say you weren’t warned when McKesson and its peers come asking for more money. Here are direct links to the information about McKesson’s second fiscal quarter of 2017. As always, I encourage you to read the original source material for yourself. BTW, I strongly encourage you to read the entire transcript. It provides one of the most complete public statements by a CEO about how wholesalers make money—and how that might change in the future. Given the politics of drug pricing, no manufacturer wants to be hauled in front of Congress to explain a price increase. We are also in the midst of an unsustainable gross-to-net bubble. This slowdown in brand-name inflation will lead to a corresponding slowdown in wholesalers’ profits. That’s because fees from distribution service agreements are generally computed as a percentage of a brand-name drug’s list price. Therefore, the dollar value of a wholesaler’s fee payment from the manufacturer rises whenever a manufacturer increases a drug’s list price—the Wholesale Acquisition Cost (WAC). Gross profits rise faster than gross margins. Note that manufacturers and wholesalers usually have agreements that recapture the value of price appreciation on inventory held in wholesalers’ warehouses and on order with the manufacturer. If a manufacturer recaptures the full inventory appreciation value, then a wholesaler earns only the WAC-based fees. I analyze these dynamics in Sections 4.6.1. and 4.6.2. of our The 2016–17 Economic Report on Pharmaceutical Wholesalers and Specialty Distributors. McKesson therefore expects “to receive less compensation from branded price increases than we originally anticipated in fiscal 2017.” McKesson’s comments about drug pricing took down stock prices throughout the pharma and PBM sector. 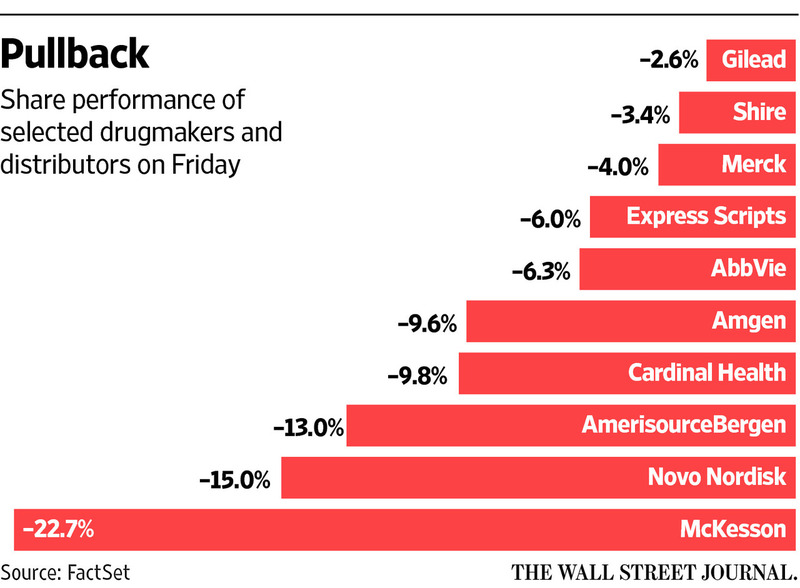 Here’s a chart from The Wall Street Journal article Backlash Against Drug Prices Hits Manufacturers and Middlemen. A drug wholesaler’s gross profit from distributing brand-name drugs can come from manufacturers (buy-side) and from customers (sell-side). The buy-side and sell-side terminology derives from a wholesaler’s buying products from a manufacturer and then selling products to a wholesaler’s customers, such as a pharmacy or hospital. I presume he is referring to AmerisourceBergen. Its historically strong position with independent pharmacies has weakened, as evidenced by its declining market share with independent pharmacies. Smaller pharmacies maximize their buying power through pharmacy buying groups, which establish a relationship with one or more preferred wholesalers. ABC may be going after these groups to regain share quickly. See Exhibits 15 and 19 of our 2016-17 wholesaler economic report. Customer mix: Payer and manufacturer network strategies are shifting specialty product sales into the largest specialty pharmacies—which are also wholesalers’ least profitable customers. In some cases, specialty pharmacies purchase products directly from the manufacturer of a specialty drug, bypassing specialty distributors and full-line wholesalers. Product mix: A wholesaler’s typical economic model relies on the blended margins from lower-profit brand-name drugs and higher-profit generic drugs. A pharmacy with a high specialty mix will buy very few generic drugs, undermining the traditional wholesale cost-minus pricing model. Manufacturer mix: For brand-name drugs, distribution service agreements with pharmaceutical manufacturers account for about half of a drug wholesaler’s buy-side gross margin. Large manufacturers pay a less-than-average fee rate, while smaller manufacturers pay much more. Specialty drugs are being launched by larger manufacturers, which means that the average buy-side margin is declining. Adding insult to injury: (1) the excess profits that wholesalers earned from the generic inflation bubble are vanishing. See AmerisourceBergen Charts the Profit Headwinds Facing Drug Wholesalers, and (2) pharmacy-dispensed biosimilars are unlikely to provide near-term profit relief for wholesalers, per Section 6.2.4 of our 2016-17 wholesale economic report. But this sunny tone was later undercut by his chilling response to a question about renegotiating manufacturer agreements. 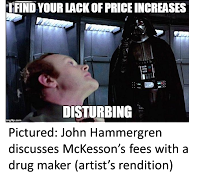 Here, "a manufacturer's behavior" means its list price increases. Hammergren's statement implies that McKesson will go after manufacturers that make a “unilateral decision” (!) not to increase WAC list prices. Shhh, nobody tell senators Warren and Sanders! Cardinal Health and AmerisourceBergen will report earnings later this week and will likely echo the themes on McKesson’s call. Strap yourself in. Wholesalers are trying to make the jump to a new profit model. This is where the fun begins.